하나님은 태초에 말씀으로 피조세계를 창조하셨습니다. 하나님의 심정과 사랑 생명 혈통을 말씀에 담아서 창조하셨기에 인간과 만물이 존재하는 데는 일정한 원칙과 법도, 곧 천도(天道)가 있습니다. 하나님의 형상으로서 완성된 인간의 모습은 말씀의 실체화입니다. 하나님의 창조의 속성인 절대신앙 절대사랑 절대복종을 상속받아 말씀을 지킴으로써 본연의 인간의 창조 본성을 갖게 됩니다. 인간시조 아담과 해와는 하나님의 말씀을 지키지 못하고 타락하여 죄악의 속성을 갖게 되었습니다. 즉, 말씀을 잃어버린 것입니다. 그러나 하나님은 참사랑의 부모이기에 타락한 인류를 구원하시기 위해 복귀섭리를 전개하십니다. 그 방법은 이 땅에 메시아를 보내시어 재창조를 하시는 것입니다. 메시아는 말씀의 실체로 오시어 창조가 그랬듯이 말씀으로 재창조하여 섭리를 완성시킵니다. 2천년 전에 오셨던 예수님께서도 말씀의 실체로 오셔서 말씀을 선포하였습니다. 그러나 유대민족은 말씀을 불신하여 예수님을 십자가에 못박았고, 예수께서는 재림을 약속하셨습니다. 2천년 후에 다시 오시는 메시아, 구세주, 재림주님도 말씀의 실체로 오시고 인류를 말씀으로 재창조하여 창조이상을 완성하게 합니다. 곧 하늘로부터 온 분명한 징표는 이 세계를 구원할 진리의 말씀입니다. 바로 참부모님께서는 말씀의 실체로 오시어 그 말씀으로 복귀의 성업을 완수하시고 계십니다. 하나님의 천의를 따라 ‘하나님 해방과 인류의 구원’을 위해 평생을 희생해 오시며 신과 인간, 세계와 역사, 영계 그리고 사탄의 정체와 천상의 모든 비밀을 밝혀 가르치셨고 그 말씀을 실현하셨습니다. 그 모든 말씀은 현재 412권의 <<말씀선집>>을 비롯한 500여권의 저서 속에 나타납니다. 참부모님께서는 ‘하나님의 해방과 인류 구원 및 세계평화’를 위해 밝혀 나오신 천상의 비밀인 500여권의 저서 가운데서 주제별로 발췌 정리한 16권을 한 권으로 합본한 본서를 <<천성경(天聖經)>>이라 명명해 주셨습니다. 본서는 제1권 참하나님, 제2권 참부모, 제3권 참사랑, 제4권 참가정, 제5권 지상생활과 영계, 제6권 인간의 삶과 영혼의 세계, 제7권 예절과 의식, 제8권 죄와 탕감복귀, 제9권 축복가정, 제10권 성약인의 길, 제11권 우주의 근본, 제12권 환태평양 섭리, 제13권 참하나님의 조국광복, 제14권 참효의 생활, 제15권 천일국 주인의 생활, 제16권 참가정과 가정맹세 순으로 편집되었습니다. 하나님의 섭리의 경륜에는 소생급 재창조를 위한 구약(舊約)말씀, 장성급 재창조를 위한 신약(新約)말씀이 있었습니다. 이와 같은 과정을 지나 하나님의 왕권 즉위식(2001.1.13)을 기점으로 천일국(天一國)시대가 열리고 하나님이 직접 주관하는 사랑과 평화의 신천지가 <<천성경>>의 말씀으로 안착되게 됩니다. 곧 천성경은 하나님의 창조이상을 완성케 하는 질리의 말씀입니다. 주제별로 엄선된 본서는 하나님의 말씀이자 참부모님의 말씀입니다. 독자 여러분은 본 <<천성경>>을 통해 하나님과 참부모님의 심정과 참사랑을 체득하게 될 것입니다. 하나님의 절대 유일 불변 영원의 속성이 실체화된 참부모님의 숭고하신 삶은 곧 말씀입니다. 특별히 인류 조상의 타락 이후 자녀 잃은 슬픈 하나님의 부모의 심정과 복귀섭리의 한 맺힌 역사를 온 몸으로 실현해 오신 참부모님의 삶이 형상화된 말씀이기에 생명의 영원한 길잡이가 될 것입니다. 일평생을 오직 하나님 해방과 더불어 하나님의 왕권을 안착시켜 드리고 인류를 창조본연의 참된 자녀로 인도하기 위해 수고해 오신 참부모님께 무엇으로 감사를 다 드릴 수가 있겠습니까? 양위분께서는 각 가정과 삶의 현장에 훈독회(訓讀會)를 안착시키어 본서의 말씀이 실천적 삶으로 결실되기를 소망하십니다. 독자제위께서 본서를 매일 훈독해 나감으로써 숭고하신 참부모님의 사랑과 심정 그리고 삶의 가르침을 깊게 이해하시고, 하늘 앞에 참된 자녀로서 천일국의 전통을 세워 나가기를 소망합니다. In the beginning God created the world through the Word. He created by instilling the Word with His heart, love, life and lineage. That is why certain principles and laws – the heavenly way – operate consistently in the life of human beings and all things of creation. Human beings, when perfected in God’s image are meant to be the embodiments of the Word. Human beings, by upholding the Word, where to attain the original nature endowed by the Creator by inheriting the attributes God manifested at the Creation, namely absolute faith, absolute love and absolute obedience. The first ancestors, Adam and Eve, did not keep God’s commandment and fell. As a result, they lost the Word and came to possess the attributes of evil. God, as our parent of true love immediately initiated His providence of restoration to bring salvation to fallen humanity. He works to re-create the world by sending the Messiah to the earth. The Messiah comes as the incarnation of the Word and just as God created through the Word; He re-creates through the Word to complete His providence. Two thousand years ago, Jesus came as the substance of truth and proclaimed the Gospel. When the people of Judea failed to believe in Jesus, he was nailed to the cross. Jesus died promising that he would return. The Messiah, Savior and returning Lord, comes as a man, and he too comes to re-create humanity with the truth and thereby complete the ideal of creation. The surest sigh from Heaven that he has come would be the appearance of the Word of truth that will save the world. The True Parents have indeed come as the substance of truth and are fulfilling the sacred task of restoration. True Father has devoted his entire life for the sake of God’s liberation and the salvation of humanity according to the heavenly will. He has revealed the truth about God, humanity, the world, history, the spirit world, the identity of Satan, and all the heavenly secrets. Some 500 volumes of True Father’s speeches have thus far been published. These include 412 volumes in the series compiling the transcripts of his speeches given over half a century. Selections from these, arranged by theme, have been compiled into sixteen books contained in a single volume, which the True Parents have titled Cheon Seong Gyeong (天聖經). In reference to this book, True Father explained: “This is the holy book for the Kingdom of Heaven. In Cheon Seong Gyeong, the word cheon consists of the Chinese characters meaning two (二) and people (人). When you think of who the two central people in a family are, you think of the husband and wife. The separation of heaven and earth came about because a husband and a wife in the Garden of Eden lost the way to love. In the course of God’s providence, God gave the Old Testament Word for the providence of re-creation at the formation level , the New Testament Word for the providence of re-creation at the growth level and the Completed Testament Word for the providence of creation at the completion level. After this, and beginning with the Coronation for God’s Kingship on January 13, 2001, the era of His Kingdom of Cheon Il Guk began. The new heaven and earth of love and peace under God’s direct dominion has appeared and it will be completely settled through the teachings of Cheon Seong Gyeong. Cheon Seong Gyeong contains the very Word of truth that will guide humankind to fulfill God’s ideal of creation. The reader will come to experience the heart and true love of God and the True Parents. 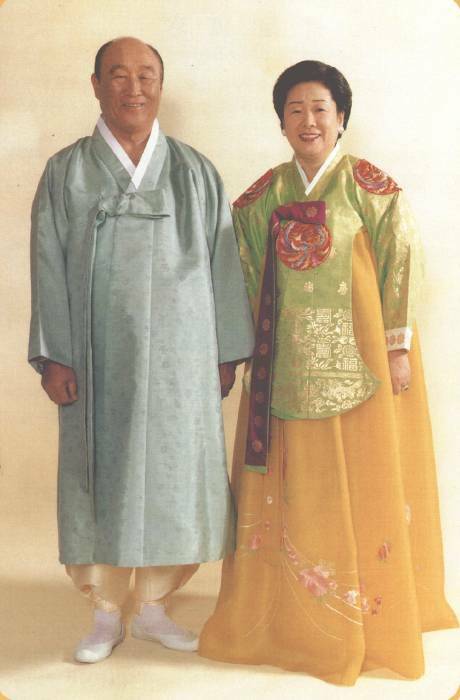 Throughout their exceptional lives, the True Parents have embodied the attributes of the absolute, unique, unchanging and eternal God. The words of Cheon Seong Gyeong express True Parents lifelong experience of the sorrowful heart of God, the Parent who has lost His children due to the Fall of the first ancestors. The words reflect their experience of the history of the providence of restoration, filled with bitter grief. As such, these words contain eternal guiding principles for our own lives. The True Parents have devoted their lives solely for the liberation of God and to firmly establish his kingship. They have guided all humanity towards becoming the true children of God, as He intended at the time of creation. For this we are deeply grateful. True Parents hope that the Hoondokhwae tradition of reading the Word will take root in each family and in all aspects of life, so that the truth contained in this book will bear fruit through a life of practice. It is our earnest wish that you will read this book every day to gain a deeper understanding of the True Parent’s love, heart and teachings, and their noble way of life, and the you will go on to establish the Cheon Il Guk tradition in your own lives as true children of God.